Celtx lets you dabble in script writing without the $250 investment that you might make for its rival Final Draft. Celtx has been pared down, and it has a set of features that comes at a much better price. For the full Celtx Plus package, it will cost you a reasonable $15, and sometimes you can find it for sale for $10 at the company's website. It also comes with a 15-day free trial, which means that you can get a sample for how the software operates and whether or not you want to buy it. Along with the $15 paid version, Celtx also offers a personal-use free edition that puts screenplays front and center as part of its software. 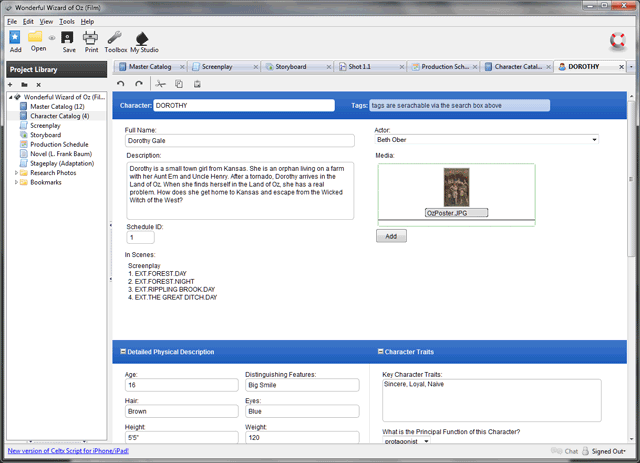 However, if you choose Celtx Plus, you will have access to catalogs, specialized view modes and storyboards. Celtx Plus includes clip art along with other extras. While costing much less than its screenwriting rival, "Final Draft," Celtx manages to include many of the same features, but it costs maybe five percent of what you'd pay for Final Draft. If you want a less expensive entry into the world of screenplay writing, Celtx gives you that entrance. The advantage of Celtx is the wide compatibility available for both the Plus and free editions. Whether you have a Mac, Linux or PC, Celtx supports all these platforms. In fact, even if you are mobile bound, Celtx also has a mobile version that works for both the iOS and the Android. Developers called the mobile version Celtx Edge, and the software makes use of the Google Docs model to write a script. You also have other writing tools that can be used to write from the browser window. Some people might find it a bit of a hassle, but the download button will take you to the vendor's site, and you will have to register at the site before you can download the free version or Celtx Plus. This software has become a creative writing stop, and you do not have to worry about the price barrier that you had with Final Draft. The greatest advantage of Celtx relates to the wide host of features that you will have. The lower price gives it an unquestionable advantage over Final Draft, and you have a cross-platform capabilities that have helped this screenplay writing software to separate itself from its rivals.